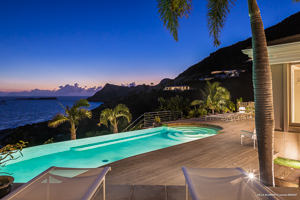 Villa UJV 389, also known as Acamar, is a wonderful, 3-bedroom island retreat. Hidden on the far side of the island, on the hill overlooking the Toiny and Grand Fond area. It offers dramatic ocean views and tranquility. This villa is full of surprises: from the sweeping views to the spacious layout, from the gourmet kitchen to the home cinema. The living area is huge, and stretches the length of the villa, with several seating areas on both sides, it can be closed off, or left completely open. Off the living room is an entertainment/home-theater room with projector and cinema seating, as well as additional amenities. The gourmet kitchen has several food preparation areas and a large cold room. The outdoor guest bathroom with shower is convenient when using the pool. The large, heated pool is located on the far side of the main deck featuring several seating and lounging areas as well as a hot tub. The fully air-conditioned master suite has a separate office space, a large dressing room and a spacious bathroom with shower. The bedroom comes with a king sized bed and opens up to a private terrace overlooking the ocean. A separate door leads directly into the pool for an early morning or midnight splash. Next to the master bedroom is a second king bedroom. The ensuite bathroom has both an interior and exterior shower and a private terrace. Spiral stairs lead down to an air-conditioned game/fitness room, and the third bedroom. This bedroom also has a king sized bed, an open bathroom with shower and a private terrace. This is an ideal family villa and for offers guests plenty of tranquility.